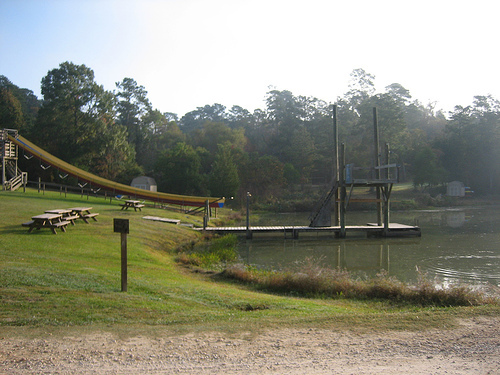 On June 23 all the young women at my church got to go to Camp Cho-Yeh in Livingston, Texas. My cabin was Cabin 11. I got to be in the same cabin as my friend, Clara. I am an inside person. I’d rather be inside reading a book than playing outside. So this was a big change for me. Especially when it was 105 degrees outside! I also never spend the night at anyone’s house. My mom has to really know the parents first. So I’m never away from home, and being away from my family for four days was kind of hard. I had to stick up for my friend lots of times because the other girls in our cabin would be mean to her. The other girls in my cabin were Autumn, Gabby, Mary, and Sarah. My YCL (Youth Camp Leader) was nice, but she was hardly ever in our cabin. She would go to other cabins and sometimes even slept in other cabins. One time she didn’t sleep in our cabin, and we woke up at 7:30 when we were supposed to get up at 7:00. But it was her first year of being a YCL. When we talked to her about it she said, “Well, I wanted you to branch out and go to other cabins and make new friends.” We weren’t even supposed to do that. Even though our YCL wasn’t always there we still had our adult leader. She was super fun! She always did her hair in crazy styles. We learned lots of camp songs, and before we had dinner we would see which table could sing the loudest. The table that sang the loudest got to be the first in the lunch line. We got to swim in the pool and in the lake. The swimming pool had a diving board, and the lake had a big slide going into it. It was so much fun! The lake, the pool, the campfire, and all of the activities were a log way from the cabins. So we had to hike there. It took 30 minutes to get to the campfire. We went at night with our flashlights. A couple of people got sprained ankles because it was uneven ground. They even had to cancel one of our hikes because the distances to each place we had to go was added together and the total was more than 6 miles! My mom and my sister came up to the camp. I was glad because I was really missing them. We went to do a service project at the local cemeteries. They were behind on their genealogies so we recorded what was on each headstone. Then after that, Mom took me home, and I was really glad to sleep in my own bed again! Camp was really fun! I think this was good for me to do. I made more friends and have a better relationship with people at my church. Nice report on your summer camp experience, Amber! I remember going to summer camp, too. I think I only did it once, at least formally. Many other times as a teenager I went with friends into the deep woods for days at a time on horseback, camping out, sleeping on the ground, hunting with rifles, and cooking and eating squirrels after our hunts, along with other food we packed in our saddlebags. I have to say that I didn’t like the formal summer camp as much as the days and nights traveling on horseback and camping in the woods. The summer camp was too regimented for me, to be honest (little did I know what the future held!). Yep — shot them, skinned them, dressed them, cooked them over an open campfire, and then ate them, usually with canned pork ‘n beans. Suffice to say, our campsite was always quite musical. But there’s more…. We used to have squirrel at home, too. In fact, your uncle (my brother) loved squirrel brains. That was his favorite dish. He always had dibs on the skull. He’d take it, crack it open, and scoop the brains out. He never had any competition, really, because no one else wanted the brains. Don’t believe me? Ask your grandmother. What’s the difference, really, between eating squirrels and eating cows, pigs, chickens, etc.? You guys are so squeamish! People all over the world eat brains, intestines, tongue, etc. When was the last time you had a nice sausage? In any case, I don’t eat any of that stuff….